Young people came from all over the country to be apprenticed in London. For the family historian, their origins would probably be untraceable were it not for the apprenticeship registers of the City Livery Companies which give details of the name, occupation and parish of the apprentice's father. For this reason, The Society of Genealogists has commissioned a series of abstracts of such registers with the aim of covering all apprentices up to about 1800. After that date, the number of apprenticeships started to fallconsiderably and fewer apprentices came from outside London. 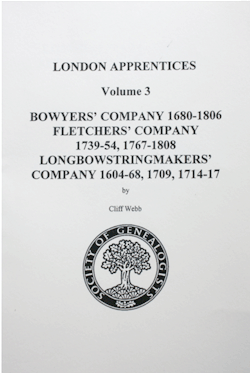 Cliff Webb abstracted and indexed the apprenticeship records of the three companies associated with the bow and the arrow: the Bowyers, the Fletchers and the Longbowstringmakers. These were published in 1996 as Volume 3 in the London Apprentices series.